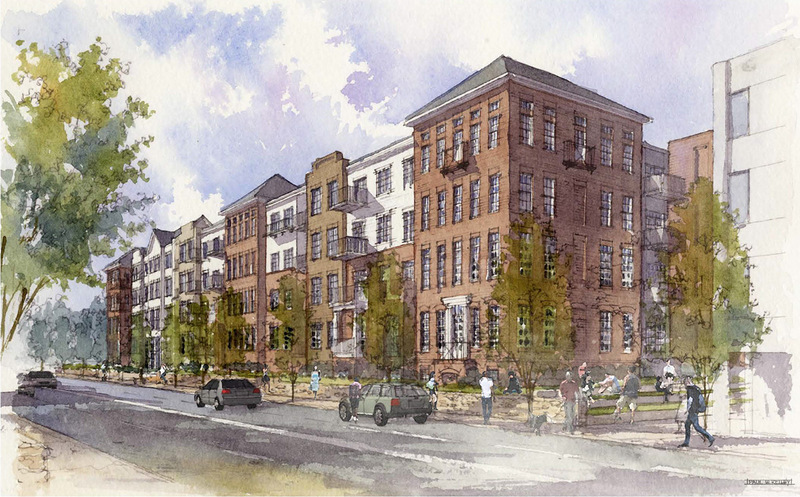 Plans to build a 200-unit, $25-million residential development on the former campus of Mercy Academy on the Original Highlands side of East Broadway have taken a major step forward. Edwards Communities, a division of Columbus, Ohio–based development group The Edwards Companies, has been granted waivers and variances from Metro Louisville’s Board of Zoning Adjustments to allow the four-story structure at 1170 East Broadway to proceed. According to Sheldon Shafer’s report in the Courier-Journal, the approvals granted Monday are the last regulatory hurdle for the project. He wrote that developers can now begin construction, but that work will likely begin in early 2016 after the winter thaw. 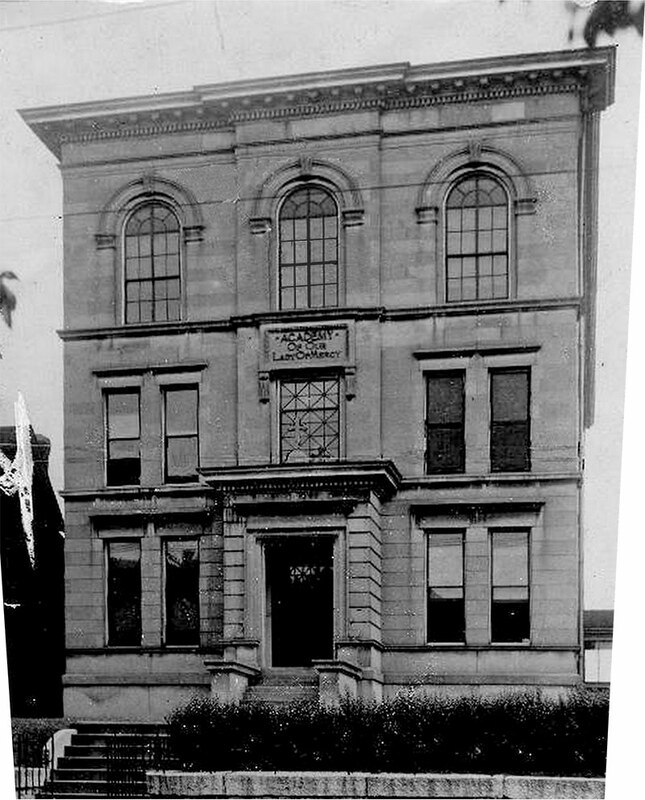 The plan would raze the former home of Mercy Academy, including its original circa 1901 structure, to make way for a large, urban-minded structure. While the site sits within the Original Highlands National Register District, there are no protections for the lone historic structure on the site, and it’s unclear if the original first-floor facade remains under a late-20th century addition. 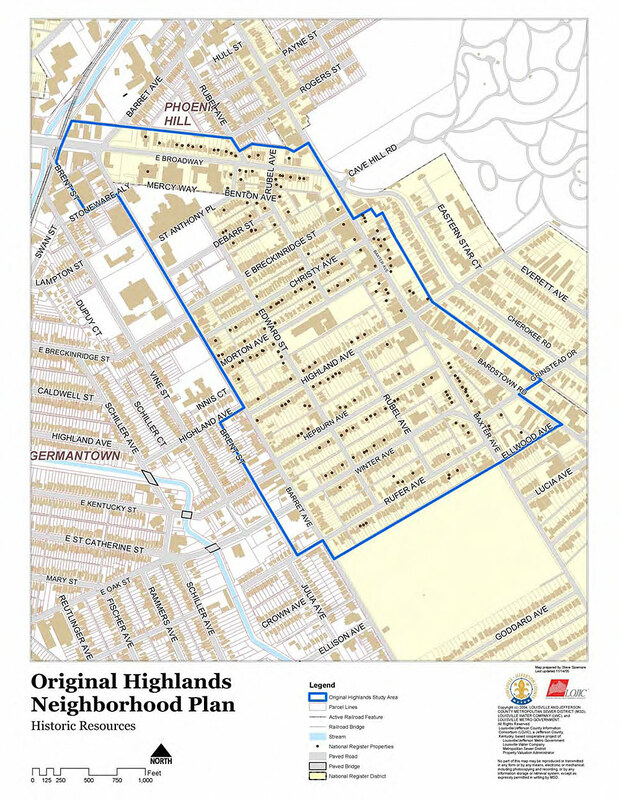 The structure is not a Local Landmark nor is the Original Highlands a Landmark District since the neighborhood stymied landmarking efforts several years ago, so no historic protections apply. According to a poll here on Broken Sidewalk, readers favored the proposal over preserving the structure or incorporating it into the design. Plans call for 194 units including 22 studios, 123 one-bedrooms, and 49 two-bedroom apartments covering nearly 200,000 square feet. Two 10,000-square-foot courtyards would include a swimming pool and underground water retention basins and tenant community space. A limestone wall on the site would be rebuilt along the street. Architects from Columbus, Ohio–based Lupton Rausch Architecture tried to break up the building’s massing into a series of distinct elements that reflect the scale of detached mansions that line this stretch of Broadway. 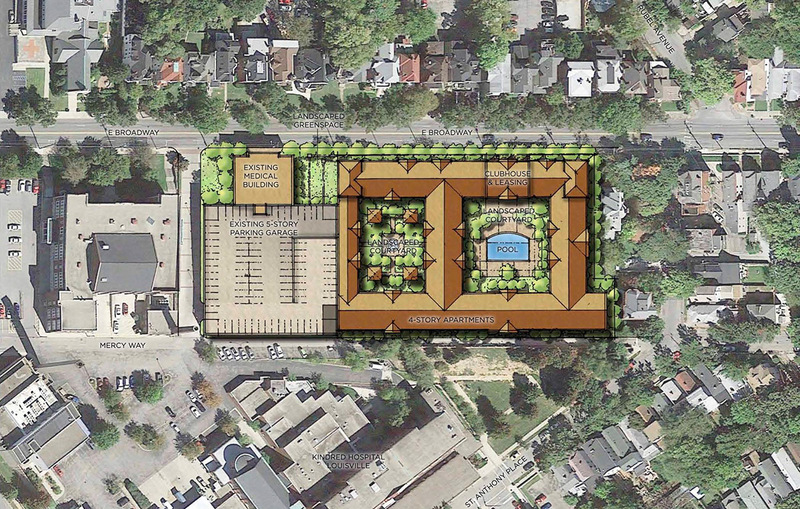 As we previously reported, the same developer is also pursuing another project a block away that would include roughly 300 apartments and retail on the former site of the Phoenix Hill Tavern. That project just beginning to become clear after a public meeting this week. Why do companies adept at adaptive reuse abandon ship in somebody else’s backyard to deliver sameness, rather than capitalizing on the quirky unique aspects that make people want to be on the streets…….? After witnessing Milhaus’ cheapo awful infill on Frankfort and Poes Woods of St Guardrail, I give little credence to renderings ….. We will rue the day we give up the intersection of Baxter and Broadway for monolithic Pruitt Igoe style living. If you wouldn’t blow up the 600 block of East Market you shouldn’t do the same here. Government subsidized of course. Taxpayer on the hook, higher taxes.